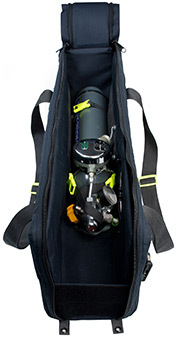 The transport bag has been developed for emergency oxygen supply of flight personnel on cargo airplanes. Life cargo, such as horses and pets are regularly checked and cared for by flight personnel. It is required to carry an oxygen supply and breathing mask to be able to quickly react to a sudden cabin depressurisation. The problem is that, the 2 litre oxygen container and breathing mask are uneasy to carry and are often put down in order to free ones hands. This is not only dangerous as the apparatus might no longer be in close range but might also be exposed to mechanical impact from falling or bumping. In order to optimise this situation, a cargo airline approached recue-tec with the question to develop an appropriate carrying solution. The target was a rugged and safe product and hands should remain free while in use. The transport bag is stored on the airplane in the crew seating area standing against the wall secured by a strap with buckle and can be carried as a backpack while in use.